Award-winning Experimental shorts, Drama, Music and Dance, Film Noir, Zombie and Animation. The programme of international shorts includes a powerful section of indie filmmakers and short dramas, with strong emotional themes and real depth. Some of these are new releases and premieres, whilst others have already received recognition and won awards. Themes are reflective and soul searching. Some films deal with opposing cultures and traditions, such as the UK premier ‘IN WHITE’, by Lebanese director Dania Bdeir, or about being deaf as portrayed in the very engaging documentary set in Africa ‘INNER ME’, and the UK drama short ‘THE SILENT CHILD’. Several films portray the disillusionment and frustration of growing up in the UK’s white working class like the award-winning UK shorts ‘ONE IN A MILLION’, and ‘SWEET MADDIE STONE’. The US drama short ‘PALACE’ addresses child abuse in Hollywood, and was executive produced by James Franco and features Academy Award winner Whoopi Goldberg. We are excited to have some truly beautiful experimental shorts like ‘FLYING TO GROUND’, the poetic 16 mm short ‘AGHARTA’ from Brasil, or the imaginative film of Israeli filmmaker and artist Maya Zack ‘COUNTERLIGHT’. There is a strong section of music and dance films, among them the dreamlike short for the track ‘I JUST DISAPPEARED INTO YOU’ by the UK band GOL. Winner 2eme PRIX DE JURY CANNES AVIFF. Directed by award Winning Director Roxana Vilk and Shot in Scotland and Iran. Absolutely hilarious, fun, sweet, and yes, even scary, are the zombie film ‘CLAIRE & BRUNO’, and the film noir ‘BANK ROBBER’S SERENADE’. Both from France and highly recommended! Also worth seeing is the high quality political mystery ‘THE PECULIAR ABILITIES OF MR MAHLER’ set in the former DDR of German filmmaker Paul Philipp. The festival is open to a diversity of different voices and points of view, and a selection of LGBT films are part of the festival, like the intense Polish debut film ‘THE END OF MY WORLD’ or ‘SWEDISH COUSIN’ from the two Argentinian female filmmakers Inés María Barrionuevo and Agustina San Martín. The film was screened at the Berlinale 2017. The festival has organised two masterclasses and a panel discussion. They are free and open to the public. One of the topics is PITCHING by filmmaker and author Charles Harris, and STORYTELLING by Ray Grewal, who will also talk about his work at Creative England. The Awards Ceremony will be held at the Courthouse Hotel, Soho, on 20 August. 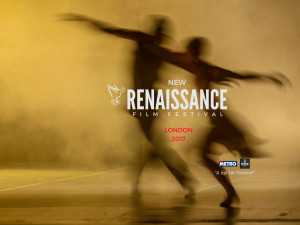 Jan Hendrik Verstraten and Massimo Barbato are the co-founders of the New Renaissance Film Festival, which was established in London, UK, to provide a stage for inspiring artists and storytellers. Read what people are saying about NRFF.